Record breaking low temperatures caused a sustained deep freeze this winter. This was followed by an ice storm and cover of sleet and snow that lasted for days. Most of the plants that are used in our landscapes in zones 7a & 7b are not rated to handle this type of weather. Some damage is likely. The extent of the damage won't be known till late April or May. Wait until then to determine what needs to be pruned or replaced. The exception would be any plants or trees that may have broken or become uprooted due to the weight of the ice and snow. As the snow and ice melts, again, I venture outside to observe what affect this has had on my landscape. 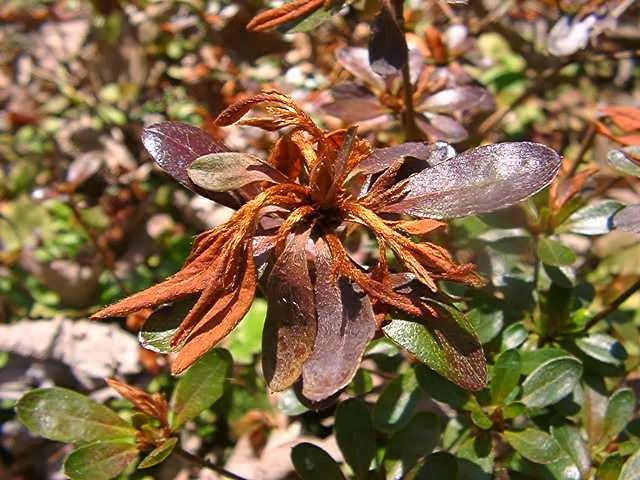 There's obvious leaf damage on azaleas, loropetalum, indian hawthorne and other broadleaf evergreen shrubs. My beloved rosemary looks sad too. All of these plants have leaves that have turned black, grey or another peculiar color. Some have lost a few leaves, others have lost most of their foliage. The cold damage is most obvious on foliage. Severely affected foliage will drop off of the plant so be prepared to rake and remove this foliage. Don't prune the bare branches now. They might resprout leaves. Wait and see what happens. 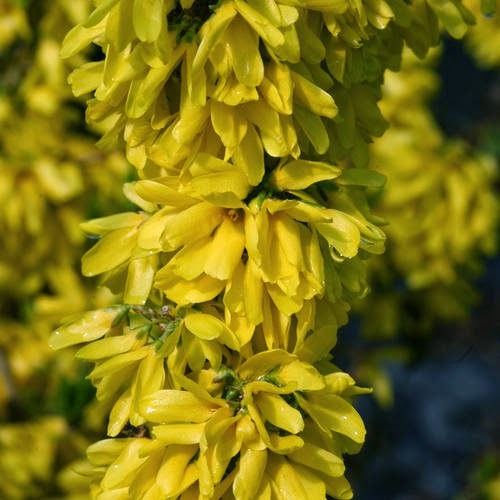 What you may not notice immediately is damage to flowers, flower buds, bark and roots. Flowers on camellias certainly did not make it. Flower bud damage on camellias is easy to spot due to the size of the bud at this time of year. If the buds are black, they are obviously dead and will typically fall off the plant. 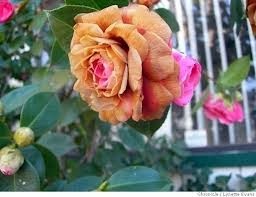 The debris from flowers and buds should be removed from the ground so as not to harbor fungal diseases. 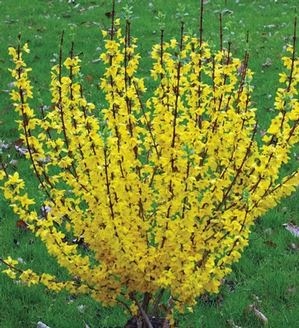 Other plants with developing buds may have sustained damage thus there will be less flowers this year. Some plants and trees experience split bark which then causes the limb following the split to decline or die. This happens often on indica azaleas and yaupon trees. Root damage is harder to detect. I will be observing plants throughout metro Atlanta and will share typical findings in future blog posts, so stay tuned! 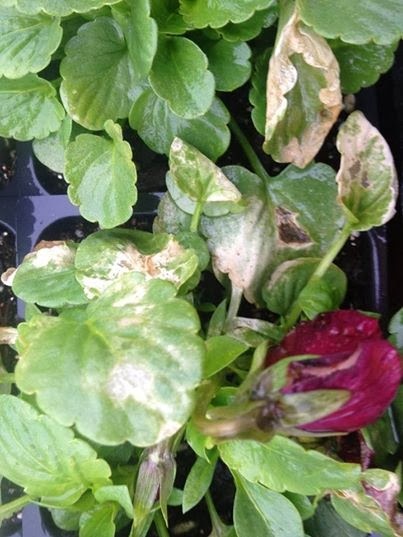 Some pansies have damage, especially red & white ones. The bleached leaves and stems can be pinched back to remove that damaged foliage. The pansies will recover quickly. If a young tree or shrub became uprooted due to the soft soil and weight of ice and snow, it should be straightened as soon as possible. No need to rush out in the snow to do this, just get it done in the next week or so. Do not yank on the trunk to pull it upright. Instead, the root ball should be dug and shifted to the upright position. Stakes will be needed to hold the plant upright. Pruning is recommended to reduce the weight of the canopy and the limb-to-root ratio. This plant then needs to be treated as a newly installed item so be sure to water it and give it some tender loving care. Major broken limbs on large shrubs and trees should be pruned soon also. Additional pruning might be needed to reshape the entire tree or shrub to return it into a balanced shape. Always make pruning cuts at the branch collar. Do not use black pruning paint over the cut. The trunk of the shrub or tree will heal on it's own if you prune it as indicated. Make your first cut where indicated. This reduces the chance of the limb ripping off the tree. 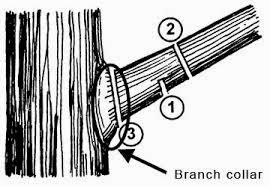 Your second cut (2) will remove most of the limb and weight so that it is easy to make a clean third cut at the branch collar. Schedule a "Garden Walk and Plant Consultation" if you need assistance with pruning. I can advise what needs to be done or teach you how to do it. Later in the spring I can evaluate what needs to be replaced and help you decide if the same plant should be reinstalled or a different species chosen. 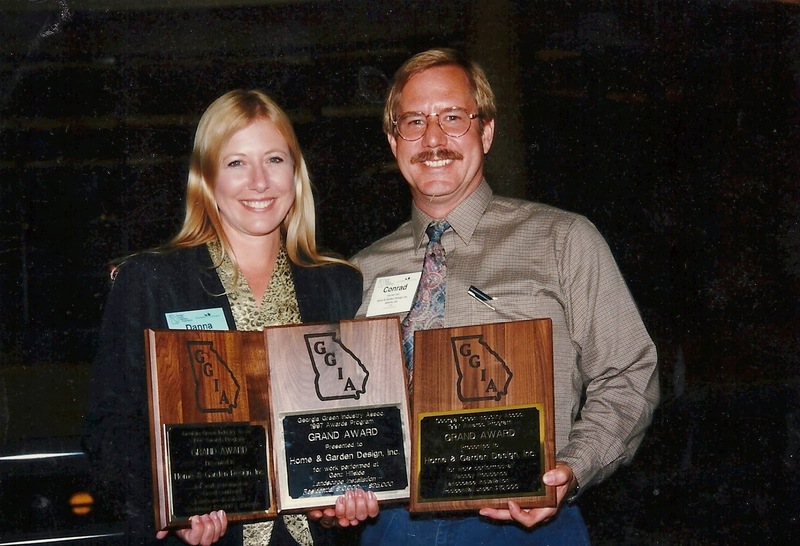 Home & Garden Design, Inc.
Atlanta Business Chronicle recognizes us in "People in the News"
"Best Of Houzz". HGD wins for second consecutive year! 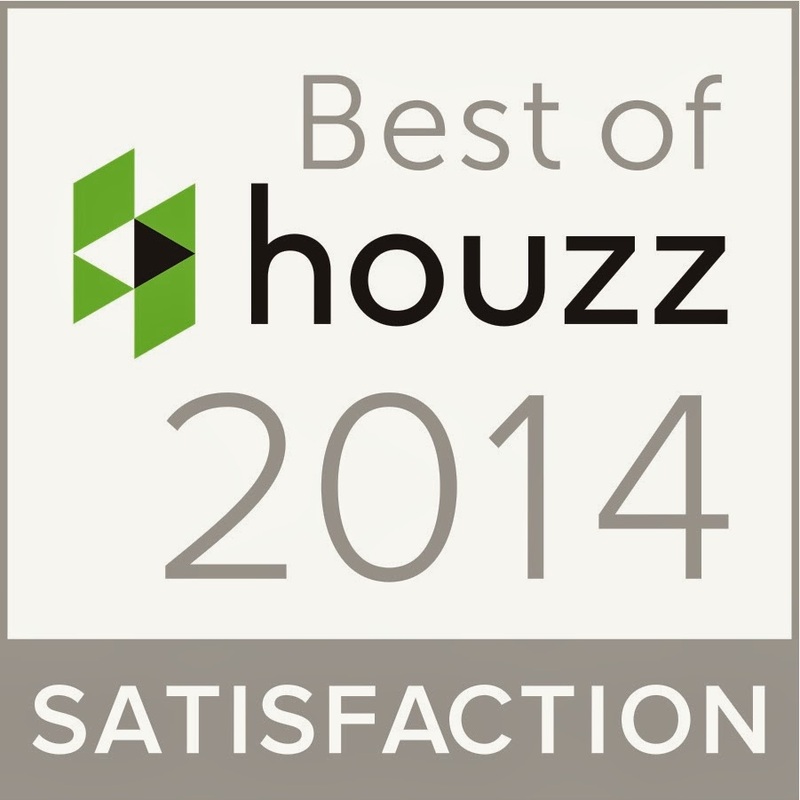 "Best of Houzz 2014" Customer Satisfaction Award given to Home & Garden Design, Inc. - Atlanta. We are beyond excited to receive this for prestigious award from the Houzz community for a second consecutive year. 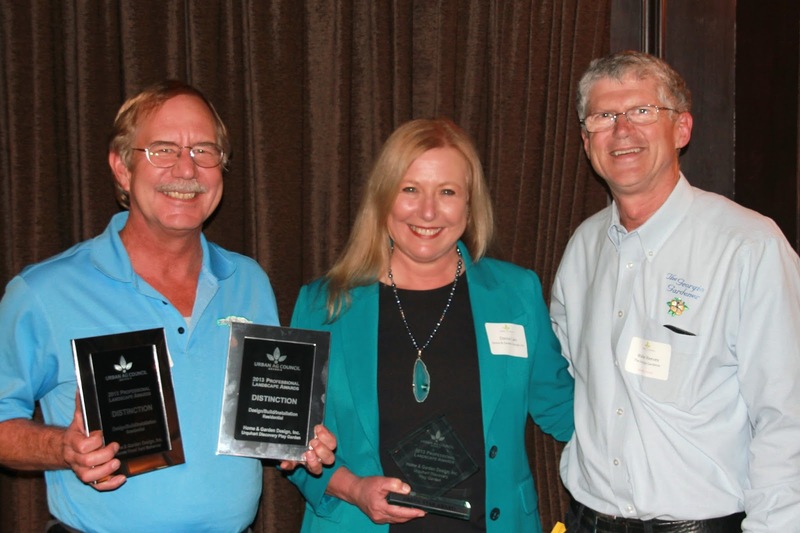 We were chosen to receive this award by the more than 16 million monthly users that comprise the Houzz community. Only 3% of all Houzz professionals receive this prestigious award that comes with a “Best Of Houzz 2014” badge on their profiles, showing the Houzz community their commitment to excellence. These badges help homeowners identify popular and top-rated home professionals in every metro area on Houzz. You can see our profile here. 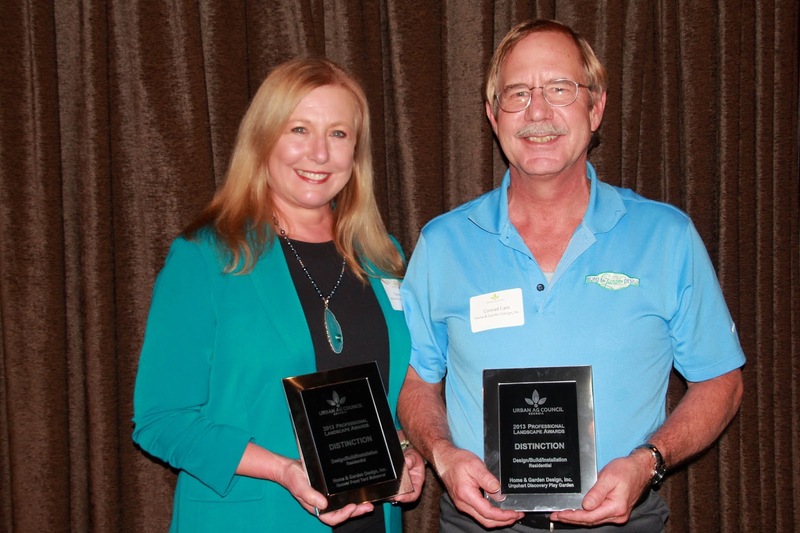 This national recognition is so significant, as it is based solely on our clients’ satisfaction. We work closely with our clients throughout the entire design process to make sure that they are happy with every decision. In fact, we encourage them to utilize the inspiring photos on Houzz to communicate with us about their dreams. The Houzz database is easily searched for plants, hardscapes and design styles which our clients can assemble into digital "Ideabooks". These quickly and clearly enable us to understand the look that our clients prefer. We then start the design process by providing multiple concepts for them to choose from, and then build on each decision until the entire project pulls together. Creating a beautiful and functional outdoor space is a thoughtful process that requires both artistry and technical knowledge. We truly love what we do and thankful to Houzz for this wonderful resource. You can see our profile here. Rolling planters present an opportunity to grow flowers and edibles in places never before possible. What if the sunniest place in your yard happens to be in the middle of the patio where your tables and chairs are? Since you rarely sit there every day and certainly not all day long, consider this ... push the furniture aside and roll your planters to that location so your plants can benefit from the rays of the sun! I discovered these planters while searching for a solution for a family living in a mid century Modern home. The industrial look of these planters fits their style perfectly. The general concept is workable, however, for any style. Choice of materials, trim and color can easily modify the idea to work with a Traditional or even a Zen garden. The key is heavy duty wheels that swivel so the planter can be moved easily in a small space. A light weight soil mix would be a benefit too, such as the soil used for roof top gardens, green roofs or hanging baskets. I can't wait to find more uses for these planters along a driveway, near a pool, or even to transform the parking lot of a church or school. There are so many paved areas that are very sunny and unoccupied during the week or during the summer. 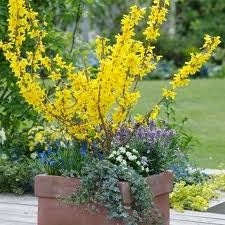 Let's make that space productive and beautiful with edibles, flowers, and even fragrant small shrubs. 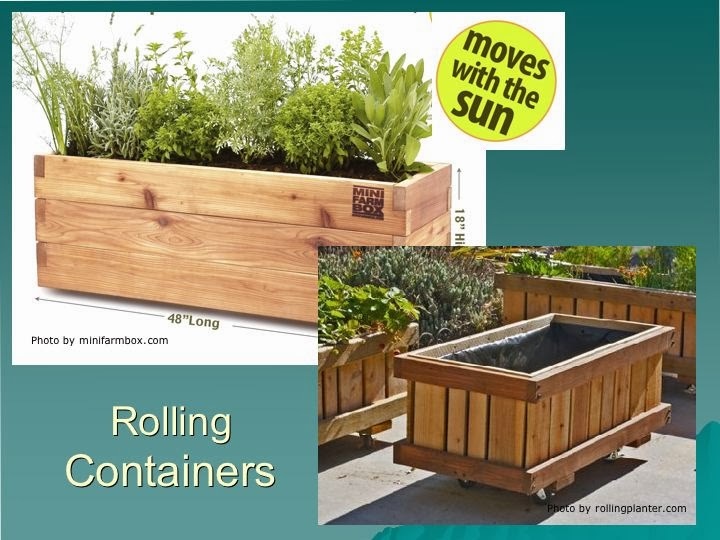 Get details about the planters shown in the photo above at rollingplanter.com and minifarmbox.com. Both are shipping from the West coast. I will be looking for other planters from suppliers located closer to each job site. Let me know if you discover anything. Read more about us and my ecological, sustainable landscapes.